Cabify released a similar statement, saying it would stop operating in Catalonia from Friday, arguing that the new rules contain ‘artificial and highly restrictive measures’. The new regulations say that firms like Uber must wait 15 minutes between rides – Barcelona metro area might extend it to an hour – which Uber said is ‘totally incompatible’ with the ‘immediacy of demand for its services’. Cabify was also highly critical of the new rules, pointing out that 98.5% of the rides it manages through its application are below the quarter of an hour limit. 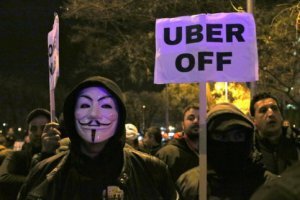 Uber, which only returned to the Catalan capital a year ago, also pointed out that the new restrictions on its services ‘do not exist anywhere in Europe’. The regulation was at the center of a recent strike by Barcelona’s taxi drivers, who agreed to go back to work after the government made concessions over the 15-minute interval. The decree passed by the government now allows municipalities to set additional times as they see fit, with the Barcelona metro area aiming to lengthen the waiting time to an hour. However, this was seen as excessive by the ridesharing firms, who warned that the new rules would see companies close, with as many as 4,000 people losing their jobs. In fact, on Wednesday, Grup Vector, the ridesharing firm with the most licensed drivers in Catalonia that operates under the Cabify app, informed the authorities of its intention to lay off a thousand people. In a letter to the labour department, the company blamed the government for being ‘responsible for the lay-offs’ and demanded it compensate the employees. Meanwhile, the Unauto union, which represents ridesharing drivers, has said it will launch a score of criminal lawsuits against the government and other authorities involved in implementing the new regulation.